Healthy eating to prevent disease is not new; we’ve known this for years. By now we know that the things you eat impact your health, both in a good way and bad. If fried food, soda, baked goods, and sweets are your 4 major food groups, you can expect to encounter several diseases in your lifetime. Smoke or chew tobacco; drink alcohol to excess regularly; and you will likewise experience poor health. So, the question is this. 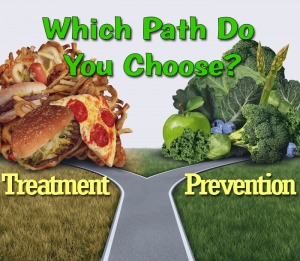 Would you rather prevent disease before you experience it, or treat disease once it has impacted your life? As a young, healthy adult you probably didn’t even give this question a second thought, let alone a first. But it’s never too late to start. You probably agree that heading off disease is your best option for good health and longevity. Who actually wants to treat diabetes, heart disease, cancer, and many others? Let’s be honest, it’s best to keep these diseases at bay rather than treat them after they develop. Here are 5 simple healthy heating tips to prevent disease. When you adopt them you turn mealtime into a disease-preventing activity. The DASH diet is recommended by the American Heart Association (AHA) for promoting a healthy heart. This diet has you eating mostly plant-based foods. The Mayo Clinic is recognized around the world as a leading health authority. The Mayo Clinic recommends eating mostly plant-based foods and supplementing your diet with lean meats, healthy fats, complex carbohydrates, and whole grains. These are only two of the many respected and reputable health-focused organizations that have proven a predominantly plant-based diet leads to the prevention and treatment of many diseases. You can adopt this practice by filling every plate with at least 50% plant-based foods. When you do this, you provide your body with the nutrients and minerals it craves. At the same time you also benefit from foods that deliver a limited number of calories and carbohydrates per serving. Fresh fruits and vegetables deliver a lot of dietary fiber, which keeps you feeling full long after you finish eating. This means you don’t reach for unhealthy snacks between meals in an effort to fill your empty belly. Plant-based meals, minimally cooked whenever possible, are a smart way to help you combat disease at mealtime. You might be thinking this is counter-intuitive, but it’s really not. Eating frequent meals works as long as you stick to eating healthy foods and avoid highly processed foods. Let me explain. You keep your metabolism firing on all cylinders when you eat frequently throughout the day. Your metabolism is a complex combination of processes and activities that burns fat and calories and creates energy. Your metabolic process is what keeps you alive. When it is powered up and functioning at a high level, you get more out of the foods you eat and the beverages you drink. Additionally, a fast-acting metabolism helps your waste removal process work properly. You get more nutrients, vitamins, and minerals from the food you eat, and you effectively pass waste from your system. These two bonuses of a constantly charged metabolism lead to a lower risk of developing obesity and the diseases which accompany it. Try to eat 3 major meals and 2 or 3 snacks each day. Whenever you feel a little hunger coming on between meals, enjoy a small and healthy snack. Eat sensible portions. Focus on minimally processed fruits and vegetables, nuts, seeds, and whole grains. Avoid highly processed foods, restaurant food, fast food, sugar, and white flour. Proper hydration is important to your overall health and you don’t want to short-change yourself. In fact, without water, you die; plain and simple. This may very well be the best, most important, healthy eating tip in this list. Drinking water frequently throughout the day can keep you from overeating. More importantly, water is a very good cleansing agent so it keeps your body’s waste system working properly. On average, the human body is composed of 65% water. How much water your body requires depends on several factors; your weight, age, gender, and level of activity. The amount of water you need also depends on what you eat. Calculate how much water you need to drink each day. 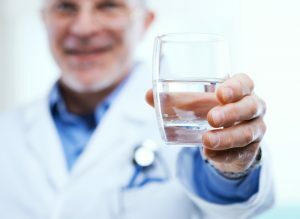 The calculator in this article,” How Much Water Should You Drink Every Day, According to Experts” will give you a starting point. Then make adjustments accordingly. You might be surprised to discover you’re not giving your body as much water as it really needs. Always remember, young or old, water is your best friend. Spreading your calories and carbohydrates throughout the day is a good way to keep your metabolism going strong. Interestingly, fasting regularly can do the same and is yet another healthy eating tip to prevent disease. One fasting practice linked to disease prevention and other health benefits is to confine all your eating activities to an 8 hour window. You don’t eat until 16 hours have passed since the last time you ate. Then you have 8 hours to eat for the day. You could eat regularly for 5 days and fast for 2 days straight. Intermittent fasting has been around for centuries because it can help you improve your mental and physical states of well-being. Portion control is good medicine. Just as healthy eating to prevent disease is important, controlling the amount of food you eat is equally important. Less is more. You probably think using smaller dinnerware is a bit silly… you’d just go back for more. What actually happens has just as much to do with your mental perception as your digestive process. First of all, your brain naturally registers you are finished eating when your plate or bowl is empty. If you begin using smaller-size dinnerware, you eventually train your brain to send an “I’m full” message when you have eaten everything on your plate or in your bowl. Many people in developed nations eat food portions that are much too large; we consume more than we actually need. When you consistently consume too much food, the overload on your digestive process can lead to gut disorders and obesity. As much as 75% of all human disease begins in the gut when it is unhealthy, and obesity is a cornerstone of multiple diseases. If you do need to pick up a burger and fries at your favorite fast-food joint, you should think long and hard before you super-size your order. It may deliver quick, short-term gratification, but in the long run, you’re not doing yourself any favors. Well, there you have it… 5 simple healthy eating tips to prevent disease. Do you have to adopt all of these tips at once? No, you don’t. But you might want to start with the most beneficial, the easiest to adopt to get you going in the right direction. Then, as you become accustomed to your new way of thinking about your food choices and eating habits, add the rest. After all, this is about your long-term health… it’s never too late to take control.